“Star Wars: Darth Plagueis” by James Luceno- Morality, Darkness, and Politic | J.W. Wartick -"Always Have a Reason"
Science fiction is such an amazing genre for exploring issues of worldview. Here, I’m taking a look at Star Wars: Darth Plagueis, a book which explores the rise of Emperor Palpatine and his Sith Master before the events of the Prequel Trilogy. 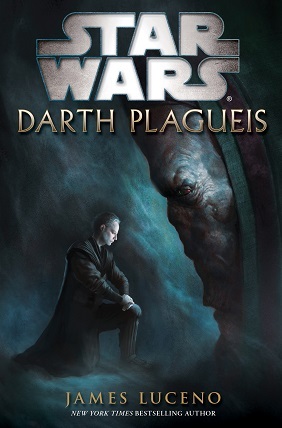 I’ll not summarize the plot, but interested readers can see the plot highlights along with my review of the book in my post on Eclectic Theist- Star Wars Expanded Universe Read-Through- Darth Plagueis. Morality: What is it, really? The exchange is chilling for a number of reasons. It is the kind of conversation which one can see play out in various discussions of ethics today. Relativists allow individuals to self-define what is right and wrong and would have no answer to the reasoning of the Sith. Pragmatists also fail to grasp the ultimate outcome of their moral system, which allows for the strong to dominate those whom they choose to dominate. The ends justify the means; or, perhaps more accurately, there need be no justification. Only systems of morality which allow for objective good and evil have any answer for the reasoning of the Sith. Only with a strong sense of morality can their blurring of what is right and wrong be overcome. Darth Plagueis is a fantastic book in the Star Wars Expanded Universe, and it additionally has a number of philosophical questions ripe for exploration. Christians should work to engage with works of fiction because so often the allow for analysis of and interaction with the Christian worldview. Here, we find that the Christian’s basis for absolute morality is able to trump other moral systems which cannot provide a sound basis for critique of the Sith or others. Yet while acknowledging that one system has the truth, we should never seek to impose it on others because of some sense of superiority. Every story has a worldview. Star Wars: Fate of the Jedi- a Christian reflection on the most recently completed Star Wars series– I have written on another set of Star Wars books from a Christian perspective in this post, which features the Fate of the Jedi series. Discussions of world religions are prominent throughout the set. Star Wars Expanded Universe Read-Through- Darth Plagueis– I review the book from the perspective of a huge Star Wars fan. James Luceno, Darth Plagueis (New York: Del Rey, 2012). Disclaimer: The images in this post are copyright of the Star Wars universe and I use them under fair use. I make no claims to ownership of the images. JWW, you conclude we find that the Christian’s basis for absolute morality is able to trump other moral systems which cannot provide a sound basis for critique of the Sith or others. If there were an actual and definable basis for ‘absolute’ morality, then why has Christian morality changed so much over time? Why do we find erudite Christians constantly disagreeing on moral matters? Why is there even an area known as ‘apologetics’ if this supposed basis is firmly established in scripture? I do not think your conclusion repairs the broken notion that morality is an ethical system. I think these differing expressions reveals the root problem behind asserting there is an ‘absolute’ morality. I think the approach you’re using and the assumptions you make to inform it is the wrong one; I think biology is the right one generally and neuroscience particularly. In other words, if you want to investigate notions of what constitute morality, the right area to study is the brain that produces it. I think science fiction, in this sense, tells us stories that are fertile grounds for our consideration of what terms like ‘morality’ and ‘ethics’ mean in different settings by different archetypical characters. It seems like this is confusing moral ontology as opposed to epistemology. Your objection here would be directed on whether we know objective morality or not as opposed to whether it actually exists. Christianity expects there to be disagreement about moral issues because we live in a world filled with sin and people who willfully ignore the directives of the Creator and the natural law God has set in place; this includes Christians getting it wrong as well (I’m sure I have and will!). But whether everyone agrees on something or not is hardly the same asking whether something actually exists. Regarding the question of apologetics, I don’t really think that was a serious question but a misleading one so we’ll just leave it. All I really mean to say is that there seems to be pretty compelling evidence that the conclusion you reach is far from a given as you present it. Even if I agreed with it, I think I would be very hard pressed to demonstrate where this basis can be found even if both of us were holding dog-eared Bibles. The assertion for an objective morality I don’t think has any compelling ground on which to stand. In comparison, I think the better approach – meaning one that can produce compelling ground available to all – rests in biology and not theology. If the Sith’s argument can be countered with physiological evidence for a damaged and distorted brain function in its areas for ethical considerations that produces such justifications compared and contrasted with non damaged brain functions and a healthy mirror neuron network, then I would think this argument would be far more compelling why we should question the Sith’s version much more closely than alluding to some nebulous objective morality well hidden in the recesses of some theological model. Who defines what is ‘healthy’? Evolution doesn’t care about ‘healthy’, unless it is defined as “that which survives to leave offspring which do the same”. What prevents Darth Plagueis from merely being the next evolution of humankind? Homo sapiens is the result of the strong surviving and the weak dying. There is absolutely zero guarantee that the current, wonderful secularism you enjoy in Canada and folks enjoy in Nordic countries will survive. TV shows like Revolution are attempts to show what happens when things get tough: the weak die off in droves. Do you have any idea of how the world will change if global climactic instability reduces global food production by 10–30%? Nobody will care one whit about your conception of ‘healthy’. All you will do, by consulting biology for morality and ethics, is pick and choose the bits you like, amplify them, and suppress the bits you don’t. You’ll go cafeteria-style on scientific results and cobble together a ‘better morality’. What you don’t seem to understand is that you’re taking a philosophical position to the evidence, not finding that philosophical position in the evidence. In the 17th century, it was mathematics which showed the most promise, and so everything had to be geometrical. In the 19th century, it was the natural sciences which showed the most promise, so everything (including economics and the other humans sciences) had to follow suit and treat people as machines. In the 21st century, it’s the biological sciences which show the most promise, so now they’re our source of salvation. Round the merry-go-round we go. Back to wanting to argue about words, again, eh Lab? Down in your rabbit hole, you seem quite eager to muddy up simple terms – like healthy in the medical sense in which it was used – and think the opaque product of your efforts is therefore deep. You then use this muddied product to launch into pure conjecture as if that magically offers a reasonable counter to the point I’ve raised… without ever really making much attempt to comprehend the point I’ve raised. This is a tedious and oft-used diversionary tactic you employ and you really must get over yourself as if you’ve a significant criticism of what constitutes a healthy mirror neuron network. You don’t (or, if you do, you certainly didn’t offer any here). You simply dismiss the point I raise by selecting a descriptor word I’ve used (and it dosn’t really matter which one it is, so often do you do this) and reassembling its meaning as if somehow the use of the word is highly questionable. It isn’t. The term refers to an absence of impairment and dysfunction. Whoopty do. And so everything that then follows in your comment is the diversion. Perhaps because you do it so often, you don’t realize how socially dysfunctional the method is you use if you really do want to reach a mutually comprehensible exchange of ideas. I don’t think this is your goal at all; it seems your goal is simply to try to discredit by foul means anything I offer (I’m sure you consider the exercise to be a fair one of academic sophistication by adding links that are tangential at best)r… even over such a simple idea that understanding the essential role brain function plays behind behaviours that we deem moral or immoral, ethical or unethical, is better served by knowledge about brain neurology and biochemcial processes than it is by assuming some disembodied supposedly objective morality finds a home here but not there on the basis of accepting some version of piety. That you wish to discredit the method of science in this regard is not surprising to me because it continues to interfere with your pious assertions, assumptions, and attributions. Yes, Lab, I’m almost sure that this problem must be the fault of someone else and especially due to the use of simple descriptor words. I just want to step in for a quick second and say I hope you two please keep it to the issues rather than analysis of mental states/etc. Thanks for stopping by and commenting, both. One need not agree with every detail of Steinbock’s descriptions of the nine central emotions (as well as many other emotional phenomena) in order to appreciate the richness of his phenomenological descriptions. They are detailed and form a unity that paints a portrait of the person without constituting a “theoretical” account of the human person. Yep, let’s ignore that theoretical person. And then, via sleight of hand, we can inject our particular conceptions of ‘health’, our particular conceptions of ‘the good’, all while appearing like 100% objective, good little scientists and/or philosophers. Now what might that term ‘dysfunctional’ mean? All I’m trying to point out here is that In regards to the hypothetical Sith – or anyone else for that matter – we wight alter our perception of their ‘moral system’ if we have compelling evidence that there is physiological evidence of impairment or damage to areas of the brain activated by moral considerations. In particular, if the mirror neuron system was similarly impaired or damaged, we would expect to find the dysfunction caused by these changes to be expressed by behaviours we identify as having some ‘moral’ affect deemed different from the norm. This presentation could easily be categorized as ‘immoral’ or ‘unethical’ behaviour. What I’m pointing out is that behaviour alone (and the reasoning given by the presenter to justify it) is not necessarily an indication of some different ‘system’ of morality in play but a different physiology at work. Our explanations about morality I think need to include this consideration, which is why I suggest that inquiries into morality will be better served by first understanding the biology that produces it and the significant effects caused to behaviour (and the reasons that justify it by the presenter) before we rush into a more philosophical explanation about ‘moral systems’. While growing up, the vast majority of my peers did not empathize with me. Yeah, I was different. I was a bit awkward. And yet, unless you want to affirm that the majority of mirror-neuron systems of middle-to-upper class middle-school and high-school students were ‘dysfunctional’, you’re producing a scientismic stamp of approval on their treatment of me. And so you likely allow the normals to persecute the non-normals, based on nothing other than statistical frequency, nothing other than demographics. If you’re going to start blabbering about how “empathy is the basis of morality”, I’m just going to laugh. The only way this actually works is to hold empathy to a non-biological standard, such that what constitutes ‘healthy’ is something non-biological, something very much like a Platonic Form. And yet, it is precisely that from which you desperately want to escape. For if there is any possibility of active conformity to a Platonic Form (or anything like one), then there exist causal powers for producing said conformance. That is something you cannot tolerate. Our explanations about morality I think need to include this consideration, which is why I suggest that inquiries into morality will be better served by first understanding the biology that produces it and the significant effects caused to behaviour (and the reasons that justify it by the presenter) before we rush into a more philosophical explanation about ‘moral systems’. I don’t object to feeding more evidence into our understanding of morality. What I object to is making the standard of morality some scientific finding about how morality currently works inside of brains. Unless you truly believe in something like Rousseau’s ‘noble savage’, such that we will act more morally if we just let our brain be more ‘natural’, then your standard for better and better morality does not lie in the results of science. It can be influenced by the results of science, but not determined. tildeb: It’s called making meaning and we – you and I – do it constantly without any external causal agency directing us in how we assign importance to the meaning we make. That’s why the same input experienced by thee and me can be held to radically different levels of importance as to its meaning. We do the assigning. Somehow, you expect the two of us, with possibly “radically different levels of importance”, to somehow reach agreement when we interpret ‘the evidence’ through the lens of that importance. This is simply incoherent, to me. It is as if you think that one can derive values from scientific study. The Christian, in contrast, believes that we need “external causal agenc[ies] directing us in how we assign importance”, although he/she would be careful to distinguish between ‘determining’ and ‘influencing’; your use of ‘directing’ could mean either. Agape does not compel, so the Christian would go with the ‘influencing’ option. True relationships allow bidirectional influence; only distorted relationships exhibit unilateral, unquestionable commands. Lab, let’s say someone buries an axe in your brain and you survive. Do you think your behaviour might be affected? Do you think we should take the damage done to your brain into consideration when we evaluate whether or not your actions (before and after) are similarly moral or immoral? Or are you seriously trying to suggest that the descending axe head carried with it a different (or at least altered) moral system if those behaviours are different? Look, when you say If you’re going to start blabbering about how “empathy is the basis of morality”, I’m just going to laugh. The only way this actually works is to hold empathy to a non-biological standard, such that what constitutes ‘healthy’ is something non-biological, something very much like a Platonic Form you completely lose me. I have no idea how these thoughts are linked to my ‘blabbering’ about some consideration is owed to dysfunctional physiology. Of course; this is an obvious allusion to Phineas Gage. Do you think we should take the damage done to your brain into consideration when we evaluate whether or not your actions (before and after) are similarly moral or immoral? Of course. I’ll one-up you: we should treat sexual abusers of children differently, based on whether they themselves were abused, sexually. One’s identity is formed, one is not born with it; those who are sexually abused as children grow up with distorted identities, and thus have much lower inhibitions to sexually abuse. Now that I’ve addressed your questions, please tell me whether the brains of the vast majority of my peers, who did not empathize with me, were ‘healthy’ or not. If we only stick to your examples, there may be no options to falsify your claims. You know, confirmation bias and all that. If you don’t like my personal example, we can ask whether the mirror neurons of slaveholders in the American South were ‘healthy’. Ultimately, we can ask whether it’s ‘healthy’ for animals in the wild to only empathize with some of their species. As best I understand altruism in evolution, it is impossible for empathy to extend equally to all members. There are in-groups and there are out-groups. That is what is ‘natural’. But surely you want to argue that truly ‘healthy’ functioning of mirror neurons ought to work with all people impartially. Or is this wrong—do you not define ‘healthy’ this way? I have no idea how these thoughts are linked to my ‘blabbering’ about some consideration is owed to dysfunctional physiology. Well, they only apply “if you’re going to start blabbering about how “empathy is the basis of morality””. After all, that’s what I said: “if“. I’m still not sure what your opening point is supposed to get at. It seems to appeal once more to epistemic differences rather than ontic ones, and I’m specifically referencing moral ontology. Regarding the biological approach, there seems to be no reason to embrace this moral system. For example, it simply begs the question that we should value that which is healthy. We don’t need to play with definitions of health–I grant your definition–to get this point instead. Why think that which is healthy is that which is good? “Are the Sith more awake than others, or are they blinded by ambition and poisoning power that is — in the end — destructive to self and others? Are they dreaming a dark dream? Do the good adhere to the tried, or do they fight clawingly against the darkness, rouse beings from self-serving, decadent, and cowardly stupor? Are not the good the ones who burn away veneers of delusion and drain away the bogs of vanity? You mention the dangers of pragmatism and relativism, but what about the dangers of authoritarianism, including divinely dictated authoritarian rules and punishments for their disobedience? “In the cities He gives you leave alive nothing that breathes… utterly destroy them… show them no mercy… or Yahweh will destroy you utterly… we… utterly destroyed the men… women, and the little ones of every city.” Deut. Evan MacIan was out in the garden one luminous and ghostly night… [and saw a flying ship]. And he lifted his head so that the moon smote full upon his beautiful and ancient face. The face was the face of a Greek god grown old, but not grown either weak or ugly; His strong, well-opened eyes were very brilliant but quite colourless like steel. Evan did not ask for or require any explanation. “I suppose you can take me to the war,” he said, and the silent silver figure only bowed its head again. MacIan clambered into the silver boat, and it rose upward to the stars. “They are all very beautiful,” said Evan, as if in doubt. “The Stuart——” began Evan, earnestly. “But now——” said Evan, in a low voice. “Is the war still raging?” asked MacIan. “Is England, indeed, so secure?” asked Evan. They were driving through the air towards one region of the sky… and there sprang up, picked out in glittering silver, a dome and a cross. It seemed that it was really newly covered with silver… He saw the great thoroughfare that sloped upward to the base of its huge pedestal of steps. As the flying ship swept round the dome he observed other alterations. The dome had been redecorated so as to give it a more solemn and somewhat more ecclesiastical [Catholic] note… and round the gallery ran what looked like a ring of silver statues… at the base of the dome, ran a second rank of such images, and another round the steps below. When they came closer he saw that they were figures in complete armour of steel or silver, each with a naked sword, point upward; and then he saw one of the swords move. These were not statues but an armed order of chivalry thrown in three circles round the cross. MacIan drew in his breath, as children do at anything they think utterly beautiful. For he could imagine nothing that so echoed his own visions of pontifical or chivalric art as this white dome sitting like a vast silver tiara over London, ringed with a triple crown of swords. As they went sailing down Ludgate Hill, Evan saw that the state of the streets fully answered his companion’s claim about the reintroduction of order. All the old blackcoated bustle with its cockney vivacity and vulgarity had disappeared. Groups of labourers, quietly but picturesquely clad, were passing up and down in sufficiently large numbers; but it required but a few mounted men to keep the streets in order. The mounted men were not common policemen, but knights with spurs and plume whose smooth and splendid armour glittered like diamond rather than steel. Only in one place—at the corner of Bouverie Street—did there appear to be a moment’s confusion, and that was due to hurry rather than resistance. But one old grumbling man did not get out of the way quick enough, and the man on horseback struck him, not severely, across the shoulders with the flat of his sword.